With so many residential proxy providers around, finding the one that can offer the right combination of speed and performance can be tricky, especially if you’re a newbie. Even some experienced web scraping experts don’t know all the intricacies on what makes one proxy provider better than the other. To help you decide, we’ve run several tests on Geosurf and Netnut to see which one offers the best value. 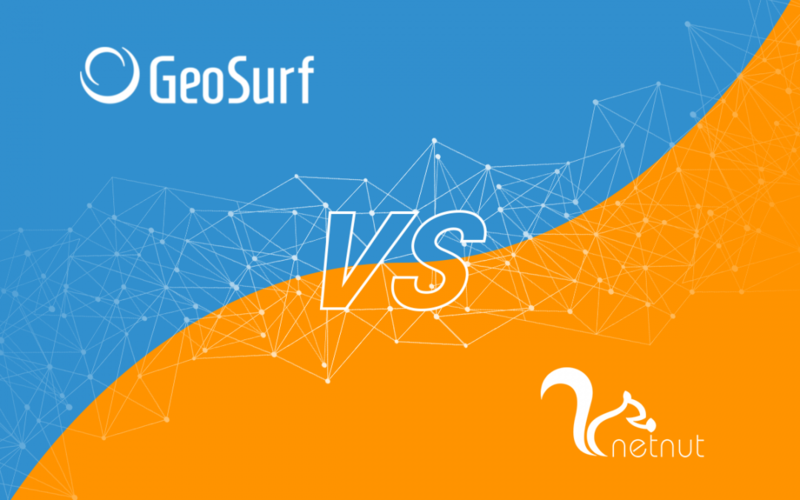 You can also check out the full Geosurf review and Netnut review or simply continue reading this in-depth comparison to learn which provider offers better residential proxy service! In the table above we see that Geosurf’s pool size is significantly larger than NetNut’s. Geosurf has more than 2 million residential proxies, and Netnut can offer only 0.5 million IPs. As for locations, Netnut supports only around 50 countries whereas Geosurf has over 130. Geosurf and Netnut use different authorization methods. Geosurf has whitelisted IPs whereas Netnut uses credentials. However, although whitelisting is usually not available while testing the Netnut service, we discovered that they can whitelist a few IPs, but it’s not something they regularly do. Both Geosurf and Netnut offer session control features. However, you should keep in mind that Netnut uses direct ISP IPs. Meaning, that their IPs are always online and you can use them as long as you want by adding a special parameter to your username. The only thing that you have to take care of yourself is rotating those IPs. With Geosurf, you can choose between 1, 10 and 30 min session times. When it comes to filters, both residential proxy providers offer proxy filtering by location. Neither of them provides a proxy type or ASN/provider/carrier filters. Geosurf proxies support only HTTP protocol, whereas Netnut has both HTTP and HTTPS. However, when it comes to dashboards, Geosurf looks a bit better because you can whitelist your IPs directly in their dashboard. As you can see, both providers do pretty well, so how come we gave the overall rating of 8.9 to Geosurf and 8.0 to Netnut? Well, the truth is, the feature comparison doesn’t give you the whole picture. Proxy performance, which we’ll examine below, is also highly important. 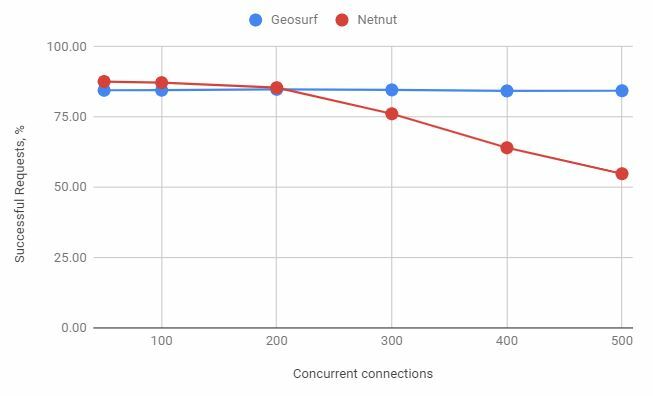 As you can see, Geosurf has a better success rate than Netnut. However, Geosurf has more connection errors, whereas Netnut received much more timeouts. In fact, NetNut has nearly triple the number of timeouts. Moreover, their blocked IPs rate is also quite high. So, it’s safe to say that in terms of the overall performance Geosurf is a better choice. Both Geosurf and Netnut are doing better than most other proxy providers. Only with timeouts, Netnut falls behind the industry’s average. Now, let’s take a closer look at the success rates. As you can see, Geosurf is beating Netnut with all targets, except Wayfair. Overall, Geosurf residential proxies perform better than other proxy providers, whereas Netnut has real trouble with Google. With this target, Netnut’s success rate is only 19.02% which is way below the industry’s standard. However, both providers achieved excellent results with Aliexpress, Amazon, Booking.com, and Yandex. We ran a concurrent connection test by gradually increasing the number of connections and put a huge load on the proxies. As you can see in the graph below, Geosurf residential proxies performed really well. They were extremely stable and had an average success rate of 84.68%. Netnut’s success rate started to drop once we set the concurrent connections on 200, and it only got worse with a higher load. See our full Geosurf and Netnut reviews to find more information on the concurrent connections test. In terms of speed, Geosurf is a clear winner here. 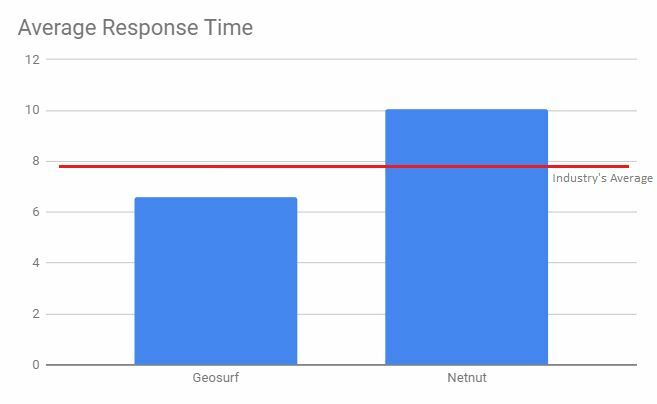 Not only Geosurf has a much faster response time compared to Netnut, but it also is faster than other proxy providers. Both Geosurf and Netnut offer pricing plans per GB. In both cases, you’ll be paying for the amount of traffic you’re using. Why Geosurf is Better Than Netnut? Quick answer – Geosurf has better performing proxies which are extremely fast, stable, and reliable. Netnut proxies perform great with small loads, but if your data collection projects are larger, you’ll do better by choosing Geosurf residential proxies. You can find Geosurf’s full review here.